Fossils from 135 million years ago are revealed in the polished stone plates and bowls made by Tony Viney at his workshops in Corfe Castle in Dorset, on the south coast of England. 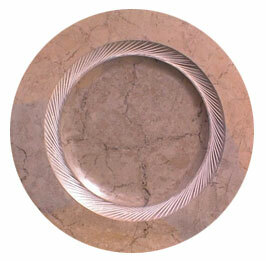 Each plate is individual and is designed to show the beautiful shells in the stone. The craft of turning stone plates is relatively rare and unusual - Tony Viney has invented many of his methods of manufacture which enable the stone to be cut thin, making his plates and bowls unusually light and delicate.